What's the Difference Between an Element and a Compound? Classifying matter becomes easy when students can visualize the actual atoms in the mixture. Using a simple assortment of nuts, bolts, and washers, offer your students this visualization and increase understanding. Is the assortment homogeneous or heterogeneous? When does the assortment change from a mixture of atoms to a mixture of compounds? 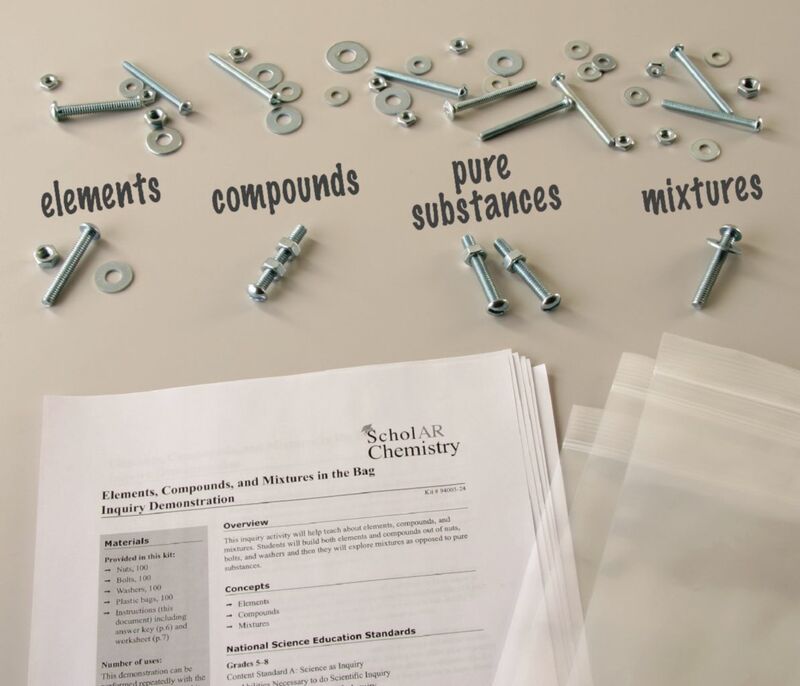 Exploring and expanding the concepts to atoms and compounds becomes much easier with this inquiry in the Bag demonstration kit. Another great kit to set up lab stations around the classroom for students to go around an build molecules out of nuts, bolts, and washers. Another option is for students to identify mixture vs. pure substances or elements vs. compounds using the items in the kit. An excellent activity using everyday objects to teacher about more complex, and often confusing topics.